Removal of the eggs from the adult frog's environment is necessary, as some adult frogs will eat their eggs. When the tadpoles develop legs and turn into a frog, they will climb on the slanted rocks near the edge of the water and rest on the rock side of the aquarium. Dress up your aquarium with a hollow log for frogs to hide in and add some aquatic plants or lily pads to the water. Secure a lid to your aquarium when the baby frogs start jumping so they do not escape. Hatching your own frog eggs is a fun and exciting project for families and kids of all ages. The metamorphosis from egg to tadpole to frog is a remarkable sight as the changes occur slowly. 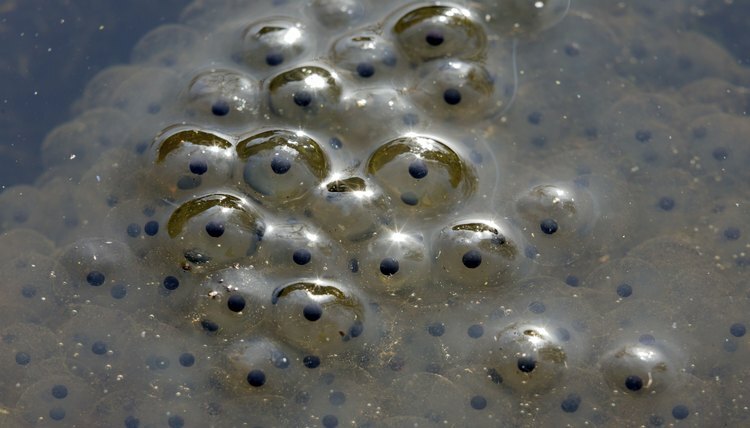 The frog eggs require their own environment that is set up correctly to hatch into tadpoles. Tadpoles require a certain diet, as young frogs and older frogs do to stay healthy. Fill a clean gallon milk jug with tap water. Add water dechlorinater drops in the amount directed on the label to the water. Amounts to use generally are expressed to treat water by the gallon. Allow the water to sit for the dechlorination process to occur. This is usually about five to 10 minutes. Place a 20-gallon aquarium in a warm area of the house with sunlight, but not in direct sunlight. Stack large, flat rocks on one-half of the aquarium's bottom, up to a height of about 4 inches. Use smaller flat rocks near the center of the aquarium that make ledges to lead up to the higher areas on the end. This is called a half and half tank for frogs. Pour the dechlorinated water into the aquarium until the side without rocks has water in it, and the side with the rocks is slightly submerged in water. Scoop the floating frog eggs out of the adult frog's environment including a small amount of the water and place in a plastic container or cup. Take care not to break the eggs. Gently place the container into the water side of the aquarium and pour the eggs out so they float on the water. Observe the eggs for about six to 12 weeks, or until they hatch into tadpoles. When tadpoles hatch, place one to two pinches of boiled lettuce into the water every other day for their food. Add one to two pinches of pelleted fish food in the water for a balanced tadpole diet. If the water becomes dirty from tadpoles not eating all the food at once, use about half the amount of lettuce and pellets. It depends on how many tadpoles hatch at once as to the exact feeding amount. A rule of thumb is to provide food that they will eat within about 10 minutes. Sprinkle live bloodworms in the aquarium water when the frogs are small and crickets are too large for them to swallow whole. Place small crickets on the rocks in the aquarium as the frogs get a little older. When they can swallow the crickets whole, change their diet to live crickets and fish food. Each frog species grows at a different rate, when they reach about the size of a silver dollar, they should be able to swallow crickets whole. This is the size of young frogs available in pet stores.